New from Steve Bragg, this book provides the tools for determining which costs a company should cut, without impacting its ability to deliver goods and services. It explains how to use throughput analysis in order to locate bottleneck operations in a company, which in turn dictates where capital investments should (and should not) be made. 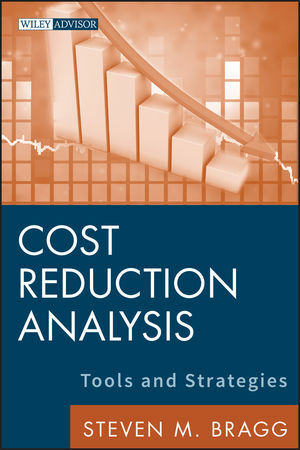 Cost Reduction Analysis: Tools and Strategies provides examples to show how much cost can potentially be eliminated to avoid drastic action later that can imperil your corporation's direction and future. STEVEN M. BRAGG, CPA, has been the chief financial officer or controller of four companies, as well as a consulting manager at Ernst & Young and an auditor at Deloitte & Touche. He received a master's degree in finance from Bentley College, an MBA from Babson College, and a bachelor's degree in economics from the University of Maine. He has been the two-time president of the Colorado Mountain Club, is an avid alpine skier and mountain biker, and is a certified master diver. Mr. Bragg resides in Centennial, Colorado. He is also the author of Accounting Best Practices and Accounting Policies and Procedures Manual, both published by Wiley.